Using the tips of her fingers and concentration in her eyes, Christie Wood delicately places a copper-lined piece of glass among already-assembled shards..
A whitish-grey piece is nestled into the design, and she places a large pushpin into the table to secure her work. She then lifts her hands up in accomplishment. In front of her lies the glass image of a lighthouse, and next to her lies a pile of similar pieces waiting to be made into the same image. The design as a whole is only a few inches tall as it is wide, but the final product will be part of a bigger picture: admiration for decades to come. Wood owns and operates Art Glass Ensembles, the sole stained glass studio in Denton. Originally set in Pennsylvania, Wood opened her business in 1993 to create unique pieces while showcasing her artistic and technical stained glass abilities. Previously a computer analyst, Wood began to do stained glass as a hobby. With no formal background in art and a bachelor’s degree in music education, Wood said she wanted to jump into something new and meaningful. The stained glass process is not one that is quickly and easily learned, according to Wood. 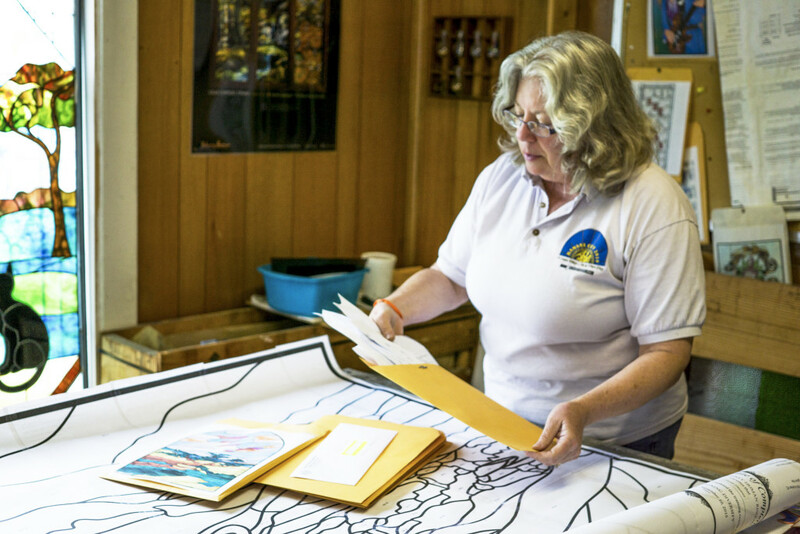 The process can take years to master and is a different medium than other art forms, which is why she feels the stained glass community may be dwindling. To create a stained glass piece, Wood starts off with a design and prints the full image to where it looks like a jigsaw puzzle. Each piece has a specific color it’s grouped with, so she glues the design pieces on top of the appropriate piece of glass in order to score or cut it. After all the pieces are cut evenly and fit together, Wood wraps each piece in copper or lead foil, which creates the lines between the various pieces of glass, and begins to construct the design. This includes soldering the glass into place, glazing the final product and cleaning it for its new home. Despite the large amount of projects, Wood has four assistants willing to gain more experience in stained glass who help out around the shop. Monique McIntyre has been working with Wood for around a year, but has been surrounded by stained glass since she was a young girl in Detroit. McIntyre said when it comes to creating stained glass, however, there’s more that goes into the piece than just the tiny details. Because she is one person in the small population of stained glass artists in the country, Wood has created pieces that now reside in locations such as Alaska, California and New Zealand. Since there are not many certified stained glass makers in the area, her artistry has also gotten her to the Oscars. For one of her favorite book series, “The Hobbit,” Wood was commissioned to create a set of six “Lord of the Rings” pieces as part of the Oscar party in Hollywood when the first Hobbit movie came out. She also creates custom pieces for display all over Texas. The three-dimensional “Pops” monument in Quakertown Park is a Wood original. Additionally, she participated in a 64-window repair, destroyed in a fire, for the First United Methodist Church in Mercedes, Texas. The project took over a year to complete, including living on-site for a month. 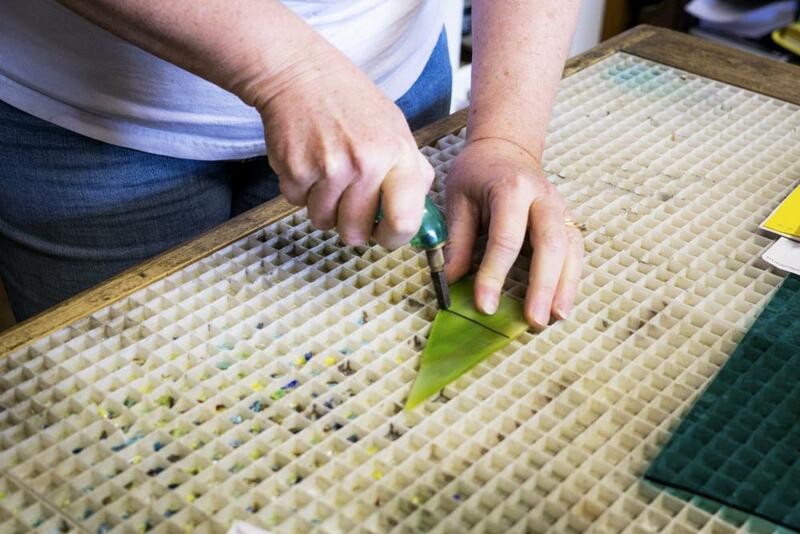 Wood said one rewarding part of creating stained glass is seeing her customer’s attachment to the piece. Longtime client and friend Debbie Vanderlaan of Vanderlaan Real Estate has had Wood create pieces for churches in the area, as well as various homes. One piece in particular, Vanderlaan said, means so much to her that she asked Wood to come take the piece out of her house and install it into their new home. Although she enjoys all the work, Wood is ready to start settling her business down a bit. She no longer teaches art classes at her storefront and doesn’t pursue as big of projects as she once did. She isn’t stopping anytime soon, however. Wood said that even if she didn’t get any more business at the moment, she’d have enough work to last her until December. In the meantime, Wood hopes to find someone willing to step in and take her place in her business. 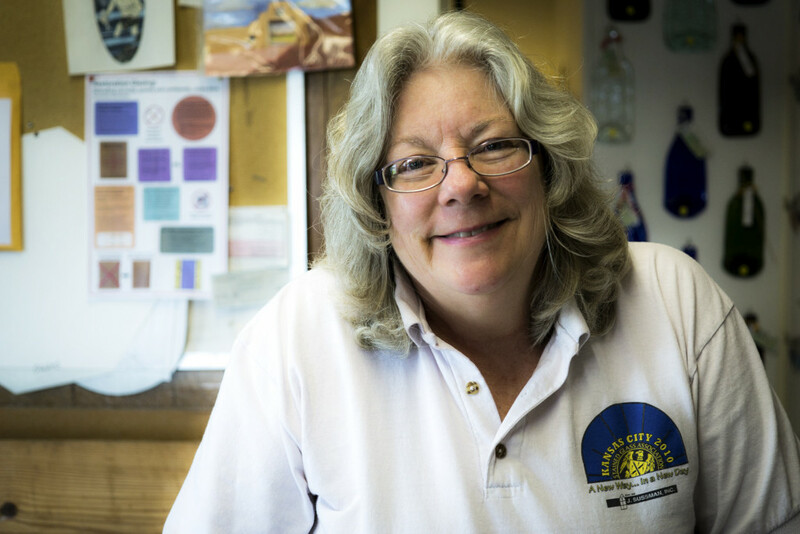 Even though she has potential candidates, she said she really wants to see more people step in to the art of stained glass. Until she finds a successor, Wood hopes to continue making an impact with her stained-glass skills. Although pieces can take months to complete or jobs may be strenuous, she cares more about the connection behind the pieces than retiring.